This was my first time making pita bread and it was a huge success. I followed the recipe directions exactly and the dough was a breeze to work with. I can’t even explain to you how much better this is than any store bought pita bread. It’s so soft and has that delicious homemade bread flavor. Brandon asked if it would have a pocket and honestly, I had no clue. But while it was baking it puffed up and we were excited to cut into it and see that the pocket had “magically” appeared. I served this with kefta, homemade taziki and zucchini. I’ll be sharing that recipe tomorrow! We’ve really enjoyed the leftovers for sandwiches this week and I’m already planning on adding this to the regular rotation. It would be so easy to make a big batch on Sundays and use if for the week. Also, The Gourmet Cookbook says they freeze well. The only complaint I have is that Gourmet calls these whole wheat. But with only 1-cup of whole wheat flour and 2-cups of white flour, I didn’t feel like I could really call it whole wheat. I’m going to experiment next time with increasing the wheat to white ratio. In a large bowl (or the bowl of a stand mixer if using), stir together yeast, honey and 1/2 cup warm water. Let stand until foamy, about 5 minutes. If mixture does not foam, start over with new yeast. While yeast mixture stands, stir together flours in another bowl. Whisk 1/2 cup flour mixture into yeast mixture until smooth. Cover with plastic wrap and let stand in a draft-free/warm place (I like to use my oven – I turn it on for about a minute to get it warm – about 80-82 degrees and then turn it off and place dough in oven) until doubled in bulk and bubbly, about 45 minutes. Stir in oil, salt, remaining 3/4 cup warm water and remaining 2 1/2 cups flour mixture until a dough forms. Either turn dough out onto a floured surface and knead, working in just enough flour to keep dough from sticking, or use a stand mixer fitted with the dough hook and on low speed to knead until dough is smooth and elastic, about 8-10 minutes. Form dough into a ball and place in a large oiled bowl, turning once to coat. Cover bowl with plastic wrap and let dough rise in draft-free/warm place until doubled in bulk, about 1 hour. Prepare 2 baking sheets by sprinkling with cornmeal. Punch down dough and cut into 8 pieces. Form each piece into a ball, flatten the ball and then roll out into a 7-inch round on floured surface with a floured rolling pin. Transfer round to prepared baking sheet. Make 7 more rounds in same manner, arranging them on baking sheets. 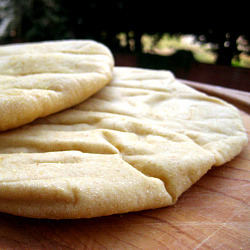 Loosely cover pitas with clean kitchen towels (not terry cloth) and let stand at room temperature 30 minutes. Adjust oven rack to the lower third of oven and remove other racks (I left the other racks). Preheat oven to 500 degrees. Transfer 4 pitas, 1 at a time, directly onto oven rack (alternatively, I think you could bake these on a preheated baking stone so they don’t get wire marks from the oven). Bake until puffed and pale golden, about 2 minutes. Turn over with tongs and bake 1 minute more. Cool pitas on a cooling rack 2 minutes, then stack and wrap loosely in a kitchen towel to keep pitas warm. Bake remaining 4 pitas in same manner. Serve warm. I’m a pitta lover, so yes this is a must try soon for me. Thanks for sharing. 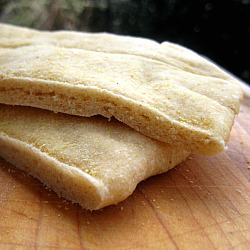 Love pita bread and it does make the best sandwiches! Great recipe pick! This looks great! I’m going to look it up in the Gourmet cookbook right now. I love your 68 Days of Gourmet posts. Nice to find another food blogger in Charlotte! on March 12, 2010 at 8:25 am | Reply quick update. « jayme bakes. I’ve been making this one too and just blogged it! its so good! Ash – I saw your pita bread post in my reader this week. I knew it was the same recipe immediately because of the marks from placing the bread directly on the rack! I hope your pita bread turned out as well as ours did! I will be creating a recipe index with the 68 recipes that I blogged from Gourmet after the project is over, as well as doing a recap post of our favorites and not-so-favorites. Stay tuned! Hopefully that will be a good resource for you! I screwed up the recipe by using AP instead of wheat flour. If anyone else does this you can still save the pitas by cooking them longer and at a higher temp. I’ve made this recipe with all wheat flour before (but it was pastry flour + vital wheat gluten) with fantastic results!